Healthy eating & dietary changes after weight loss surgery don’t have to be daunting…or even boring. Our library of expert nutritional articles and recommended healthy recipes will help you find the optimal fat, sugar, protein, nutrients and portion sizes to build an enjoyable eating plan that fits your lifestyle. Sitting down to a huge table filled with appetizing casserole dishes overflowing with delicious (and once favorite) foods can be an overwhelming situation for the bariatric person. Large amounts of food, especially carbohydrate and fat-laden casseroles, will fill you up quickly and make you uncomfortable for hours. 1) Stop drinking fluids 30 min or so before the meal, and don’t drink with the meal. Fluids will only fill up your “pouch” and leave less room for tasty food. 2) Keep your fluid intake calorie-free. No caffeine, alcohol, carbonation or sugar. Avoid sitting near the goodies and mindlessly eating while you chat with guests. You truly will not have room for the main event. 4) Find a smaller plate to use. You will be less able to over eat when you can only put less food on your plate. If this is too conspicuous or not likely to happen, then fill more of your plate with protein (turkey!) and lean vegetables. Confine your starch choices to ¼ of your plate. 5) You can offer to bring a “leaner” vegetable dish. Other fellow diners may enjoy a lighter option to the creamy, starchy, heavy side dishes. 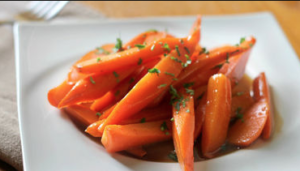 I put together the details for a Zesty Glazed Carrots recipe as a tasty example to try. Check out my post by clicking here. 6) Slow down your eating speed. You are probably pretty good at this by now. You can put your fork down between bites, chew more, and spend more time talking to your long lost relatives. Or, pace your bites with the little ones at the table, or grandma! 7) Eat lightly before you arrive. Perhaps a low calorie protein shake for breakfast that day will be enough. 8) If you had gastric by-pass surgery, regular sweet desserts will cause digestive havoc. With gastric band and sleeve, you may be able to save room for a bite or two of your dessert choice. Guests often delay their partaking of dessert because of fullness, and you can defer your dessert until later. Or, keep busy helping with the clean-up in the kitchen to avoid the pie-pushers. 9) Consider taking a walk after dinner! You may feel more comfortable moving around. 10) If you are in the process of losing weight (those first 18 months after surgery)... other people at the event may not even be aware of your “dieting”. If you are comfortable discussing your weight loss surgery with your host, you may be able to avert the constant urges from her to try more food. Each bariatric person finds a way to handle the attention that the dramatic change is weight brings. Thanksgiving is the kick-off for over a month of non-stop events centered around eating. Not to worry. The Bariatric Choice team has put together plenty of easy-to-prepare recipes that will surely (and deliciously) help out. Zesty Glazed Carrots are one example of a "leaner" recipe you can offer to bring that others can also enjoy. View the recipe put together for us by a registered dietitian, here. 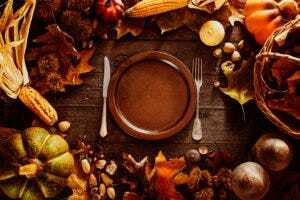 Read our collection of incredible "Bariatric-Friendly Thanksgiving Recipes" that includes low-carb cheesy tuna casserole, faux carb cheesy mashed potatoes, even pumpkin moose! Not to mention, there are ways that you may not be aware of to 'reboot' traditional many Turkey Day favorites for a post-WLS diet. Check it all out here.